Join the battle for the Iron Throne with the House Martell Intro Deck for A Game of Thrones: The Card Game! This pre-constructed deck introduces you to the mechanics and key characters of House Martell to provide a stable foundation and highlight the faction's unique features. 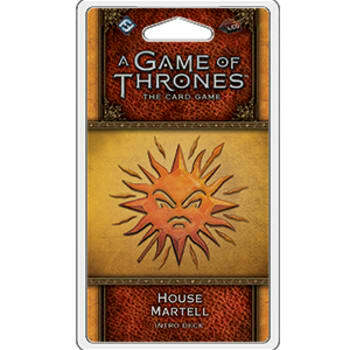 The perfect entry point for players new to A Game of Thrones: The Card Game, the House Martell Intro Deck contains sixty-nine cards that offer every card you need to begin your battles right away, whether you are squaring off against other intro decks or custom decks built by other players. By manipulating challenge icons and playing the long game, you will remain unbowed, unbent, unbroken.